The end-of-year reports on 2012 are coming in at a quick clip now – and the news appears to be consistently positive. Michigan’s jobless rate came in at 8.9 percent for 2012 and the state experienced its second straight year of job growth. (The 2009 rate was 13.4 percent.) Total nonfarm employment rose by 47,300 jobs to reach 3,983,000 – though we are still 601,700 jobs below the height we reached in 1999. On the housing front, we have seen the number of sales, as well as the sales prices, going up. This is a sign of both demand and a dwindling stock. In addition, foreclosure filings fell for a second straight year. The 2012 total of 76,711 for the state was down 44 percent from 2010’s total, and inching toward numbers seen before the housing bubble burst. All this good news has contributed to Michigan’s slight population gain in 2012, after six straight years of loss. Looking at factors behind the numbers, we realize that the main driver is domestic migration – the movement of folks between Michigan and the remaining 49 states and District of Columbia. I say this because births continue to decrease (more on that in a future post), deaths are trending upward and immigration remains fairly steady. As the table below illustrates, the last two years have shown a significant decrease in net outmigration from Michigan, with the 2011-12 period closing in on numbers experienced during the growth years of the early 2000s. Never one to put all my eggs in the Census Bureau basket, I decided to confer with several other “experts’ in the area – national moving companies. Each year Atlas, Allied and United Van Lines produce reports on their inbound and outbound shipments by state. While two continue to show Michigan as a significant net outbound state, the numbers for each are going in the right direction. The poorest performance is reported by Allied Van Lines, with 60.1 percent of their trips leaving Michigan during 2012. The good news is that it is up from 68.4 percent outbound in 2009. United Van Lines also had Michigan as a net outbound state, with 57.5 percent of its trips going elsewhere. This also represents improvement from 2009 when 68 percent were outbound. In fact, Michigan’s ranking in share of outbound trips has fallen from no. 1 during the 2007-09 period to no. 6 in 2012. We have Atlas Van Lines to thank because they have shown the world that Michigan can be an “importer” of households. Their 2012 figures come in at 50.6 percent of trips coming into Michigan – the first time in this direction! They cannot be identified as an outlier because they, too, were at 60 percent outbound as recently as 2009. While decreasing net outmigration to as low a level as possible is a key to growth, it is the demographics of those flows that are most critical. To put it simply, Michigan must work to retain and attract a young, educated work force. As I look at another birthday this week, I find myself among an older, though educated, population that Michigan already has in significant numbers. While I don’t plan to leave, or retire anytime soon, I am not the demographic that Michigan needs to concentrate on. Allow me to throw a few more numbers into the mix to put this discussion in its proper perspective. We can argue how well Michigan retains its young talent. The aspirations of Michigan’s college graduates have for years been identified beyond our borders. While we await new survey results, we have anecdotal evidence that things might be improving. We must acknowledge that the quality of life in our central cities will be key to increasing retention. Our big problem is that we are not very good at attracting young talent. A clear indication of this comes from an examination of “place of birth’ data for our 25- to 34-year-old cohort. The chart at right looks at the percentage of residents born in the state in which they live, presenting the five highest and five lowest. As you can see, Michigan leads all states with 75.9 percent of all 18- to 24-year-olds born here. This certainly does not point to a great deal of cross-pollination and diversity of geography in our young adult population. What’s more is the fact that we rate highest in home-grown residents for 35- to 44-year-olds and 45- to 54-year-olds as well! Since we are not just looking for youth (although that would be a good thing in and of itself because they tend to have babies as well), let’s look at the educational credentials of the young folk we have. If we are holding on to our college graduates, the need for an influx is not quite so critical. I am sorry to report that we are falling behind the competition here, as well. Michigan ranks 33rd among the states in the percentage of its 25- to 34-year-old cohort with at least a bachelor’s degree. We are much better when we look at those with some college and no degree (6th) or an associate degree (16th). This certainly points out the critical nature of making college affordable and attractive to those who started but didn’t finish. The chart at right illustrates the top five states and bottom five states in college graduation rates for their resident 25- to 34-year-olds. While a ranking of 33rd is certainly not going to help us attract businesses that look to locate where the talent resides, we also need to realize that we are a lot closer to the bottom than the top. Education is Michigan’s critical need – from early childhood to college graduation. We must prioritize our resources and focus all our efforts on this continuum. 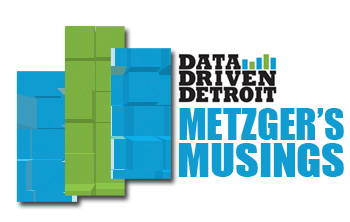 Kurt Metzger is director of Data Driven Detroit at City Connect Detroit, a nonprofit in Detroit established by foundations to build greater capacity for people to work together, and improve lives and communities. He was research director for United Way for Southeastern Michigan from 2005 to 2008 and before that, was a director at the Center for Urban Studies at Wayne State University.